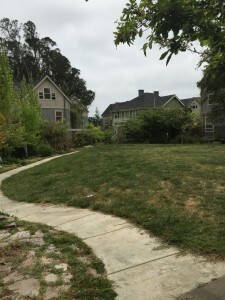 Cohousing is a fascinating model of intentional community. It originated in Europe, particularly Denmark. It’s success in the US (at least 135 identified communities in the US) is at least in part due to the fact that it looks and operates similar to existing ownership models, particularly condominiums. Cohousing communities are distinguished from conventional models by an increased emphasis on shared facilities and collective management structures. The square footage of units tends to be smaller, and decision-making is often consensus. They also tend to be designed to foster social interaction with parking lots and driveways pushed to the sides and pedestrian walkways connecting units that face towards each other. The similarity to conventional models means that they are the communities most accessible to average, middle-class Americans. As a result Cohousing communities are more often “developer driven” than other kinds of communities. Meaning, they are constructed, physically and legally, by an individual or company who may or may not actually live there, and who sells units to individuals or families either after their built or after the property is purchased. This makes it much more tenable to get a new community off the ground (or, on the ground I suppose). The other benefit of this is that it’s a business model that financial institutions are familiar with. There’s a benefit to the larger movement as well. Cohousing has done important work in establishing intentional communities as viable, and have developed ownership, financing, and governance models that are applicable to other models. They’ve helped created a framework of the questions groups need to be asking themselves. There are some drawbacks too. Developer driven Cohousing communities are more likely to struggle with interpersonal conflict. Why? Living in community steps us out of our comfort zone in many ways. We’re simply not use to having to deal with other people, and the horizontal governance structures means that we have to deal with each other. Consensus decision-making and conflict resolution are skills that involve both learning and unlearning from our socialization. Work needs to be done both to develop these skills as well as building the relationships, the sense of trust and intimacy, that will support dealing with issues like what color to paint the common house walls (easily one of the most contentious decisions groups have to make). When this work isn’t done ahead of time a group can run into trouble. But many Cohousing groups have already been through this and are passing on their wisdom to newer groups. One of the best opportunities to take advantage of this is at the upcoming National Cohousing Conference, May 29 – 31, in Durham, NC. This year’s theme is The Next Generation. This is an important event for the larger Communities Movement as many Cohousing communities are pass the 20 year milestone and new groups are starting up all the time. Hope to see you there! Also posted on Grassroots Economic Organizing. In 2013 Acorn Community suffered fires to two of their buildings. The first was an accident in their steel building, home to their auto shop and clothing storage, among other things. Several barrels of different kinds of fuel ignited, destroying everything inside. The second was an act of arson to their main residential and office building in the middle of the night by a disturbed guest. The fire was put out quickly and no one was seriously injured, but considerable damage was done to several rooms. These damage from these fires was about $125,000 and represented a huge number of person hours to repair. Acorn, started in 1993, is in Louisa County, VA. There are 3 other intentional communities in the county, Twin Oaks (1967), Little Flower Catholic Worker (1998), and Living Energy Farm (2012), and a couple more within 100 miles. There’s also a substantial community of ex-members of all these communities living in the area. There are also a number of ex-members of one community now living at another community in the area. When the fires happened the outpouring of support, emotionally, financially, materially, as well as in volunteer labor was tremendous, and the benefits of having a connected group of communities became wonderfully apparent. The three nearby communities donated considerable labor to clean up and repair efforts. There is also a labor exchange agreement between these communities so that any labor Acorn needed beyond what was donated could be done then and worked off later. Shannon Farm (1972), a community about 75 miles away collected $2,000 in donations. A number of individuals made donations of clothing and equipment donations were made to replace what was destroyed. Acorn (along with Twin Oaks) is also part of the Federation of Egalitarian Communities a small but national network of groups that, among other things do labor exchange. Seven members of East Wind Community in southern Missouri trekked 1000 miles to come help with the rebuilding effort. There are numerous ongoing benefits to having a cluster of communities. Labor exchange is a regular thing between the communities, which means there’s more people around, with more skills and more person power. There’s a standing open invitation to most social events at one community to people at the others, as well as to the extended ex-member community. Dating between communities is somewhat common, and often it’s possible to be a dual member. People sometimes move from one community to another if they figure out that the other one suites them better. There’s also an outreach benefit. Someone who finds out about one community invariably finds out about the others, and people often end up visiting more than one. There’s a similar cluster of communities in northern Missouri: Dancing Rabbit Ecovillage, started in 1997, with a strong education focus and firm ecological covenant, Sandhill Farm (1974), which makes food products as it’s primary income source, and Red Earth Farms (2005), a collective of homesteads practicing extreme self sufficiency. Similar labor exchange arrangements exist, there is local currency between the communities, and a number of products made in the different groups are sold or bartered between them. What is perhaps most notable and important is that both community clusters have regular ultimate frisbee games attended by members of different groups. These community clusters are providing a model of grassroots economics. Each community, which range in population from 10 to 100, has it’s own collectivized form of economics, usually including both money and labor in their accounting, with land (and sometimes other resources) held in common. The combined population of the cluster in in central VA is about 200, which is doubled if you include the ex-member population, and total operating budgets of well over $1 Million with assets in the several millions. The communities engage with each other in ongoing and one-off economic arrangements, both formal and informal. Association by individuals or between groups is voluntary and based on mutual aid. One of my jobs at Twin Oaks is managing the Communities Conference. We have a rustic conference site where we’ve been hosting this gathering for 20 consecutive years. While it serves as one of, and certainly the most consistent conference for the intentional communities movement, hosting it is a labor of love for Twin Oaks, which has often done little more than break even on the event, not including the approximately 1000 hours it takes to run it. What this means is the community has often been hesitant to invest much money in maintaining, much less improving the site. years, which was inconvenient for the conference and high impact on the community. I hired an ex-member of Twin Oaks from the 80’s as the project manager. She’d been living in Louisa County ever since she left and now works as a General Contractor (she’d also been hired by Twin Oaks as the General Contractor to expand the production facility for it’s tofu business). The main builder on the project was also an ex-Oaker, who recently had moved to a newly formed off-shoot community of Acorn called Sapling. Sapling is a small group, and having her doing labor exchange for Twin Oaks means they’ll be able to call on Twin Oaks labor in the future. It meant much lower labor costs for expanding the kitchen. It also provided an opportunity for a number of people to learn basic construction skills (a women’s construction workshop was organized as part of the building effort). Watching Nina up on the roof of the kitchen addition, putting the rafters in place, I was struck by the very human and personal implications for putting these important principles of economic solidarity into practice. Upgrading the kitchen would also mean bringing back a central aspect of community to the Communities Conference, cooking together. Soon there will be 200 people learning about cooperative living and working, helping in the kitchen and eating together, and getting to experience community in a space built by community for the purpose of bringing more community into the world. 4 weeks to go – need a ride? We’ve been doing a tremendous amount of work on the conference site this year. You can look forward to an expanded, fully-functional kitchen, new dome shelters for our workshop locations, and an all-around better-looking site than we’ve had for a long time. We’ll also have workshops on Anti-Oppression Work in Community , Ecological Footprinting on a Community Scale, and Urban Community Building among others. Need a ride? Can you give a ride? Once you register, if you say yes to either of this questions, you’ll be plugged into our ride share system. So, now’s a great time to register! Every year we hold a benefit auction for the Fellowship for Intentional Community, during which we bust out the desserts, and for the second year we’ll be served homebrewed beer and soda by the Baltimore Free Farm. You can bring an item to donate to the auction, and bring your generosity and form of payment for when the bidding starts. Twin Oaks Community has been my home off and on for the last 15 years. It’s one of the flagships of the Intentional Communities movement, and yet is fairly unique as one of only a handful of secular, income-sharing communities. Twin Oaks has been an active experiment in solidarity economics since 1967. At almost 50 years old it’s a successful, viable model, and, like all solidarity economy projects, it’s a work in progress. We have 92 adults (plus 17 children) sharing finances, running businesses, managing a small scale farm, sharing housing, a fleet of vehicles, and covering all other basic needs, including health and dental, collectively. No money is exchanged internally; all work is valued equally and is organized through a labor system. By contributing 42 hours per week you have full access to the resources and governance of the community. You could look at Twin Oaks as a bundle of co-ops rolled up together. It’s a big amalgamation of a food co-op, vehicle co-op, housing co-ops, worker co-ops, clothing co-op, health care co-op, and the list goes on. It’s also big enough to have a robust social culture, complete with traditional and community-specific holidays. The founders of Twin Oaks, back in 1967, were trying to bring to life the fictional utopia of Walden II, by B.F. Skinner, creator of behaviorist psychology. Twin Oaks was different from other ’60’s commune’s in that it wasn’t started by hippies, but by academics and writers. According to founder Kat Kinkade, “the hippies came later and ruined everything,” probably referring to the abandonment of behaviorism as a guiding force for the community by the mid-’70’s. According to Kat Kinkade, in addition to social experimentation, addressing classism was a major motivator in the design of the community. Twin Oaks holds egalitarianism as a core value, and it’s primary expression is income sharing. Generally speaking, each member is not suppose to have significantly more access to either the communities resources or outside resources than other members. It also means collective budgeting and accounting for the entire finances of all our members, all our businesses, and all the shared resource systems we’ve create. It’s not easy, but it pays off. Income sharing allows for the creation of an internal economy that allows us to essentially pay ourselves (through labor credits) to do work that we otherwise wouldn’t get paid for. Our systems of sharing mean that we need a lot less money to have the same quality of life that many middle-class people enjoy. On average members only work about 15 hours per week in one of the communities businesses. The rest of their 42 hours goes towards cooking, cleaning, child care, gardening, the dairy, community governance and management, etc. Most of these things of course being things that most people have to do on top of a 40 hour work week and don’t get paid for. Add to that unlimited sick time and about 4 weeks “paid” vacation, with the option of working over quota to earn extra vacation time. It’s something of an accident that Twin Oaks is also a very environmentally friendly community. We consume and waste a third or less (and sometimes a lot less) than the same number of average Americans. Environmentalism is written into the bylaws, and it is very important to many members, but the real reason Twin Oaks is so “eco” is simply because of how much we share. The other important benefit to intensive sharing is there’s an intimacy pay off. I’ve visited dozens of communities, and what I’ve seen is that the more communities share, the more they have to deal with each other, the closer they are and the more satisfying their lives are. It takes some interpersonal skill and maturity to make this work, as well as robust organizational structures that can carry things when there are majo r conflicts. Trust, responsibility, accountability, and communication are things you learn about really quickly (sometimes the hard way) in a community like this. But when it’s good, it’s amazing. I have no illusions that this kind of community is for everyone. We are not going to reorganize society into a lot of little rural intentional communities. But what Twin Oaks, along with other communities in the Federation of Egalitarian Communities, have modeled for us is that it’s possible for a group of people to come together, cover all their basic needs plus more, and eliminate poverty, homelessness, and crime. We have to learn how to share all our resources, even money. Because isn’t that the challenge we face as a global species? How do we share the earth’s resources equitably and sustainably without resorting to violence? Twin Oaks isn’t the answer, but it’s a piece of the answer. We’re looking for workshops presenters for this year’s conference. The focus of the event is of course on intentional communities, although workshops sometimes cover a broader array of topics in cooperative and alternative lifestyles. The theme for this year’s conference is Radical Resource Sharing. We are looking for dynamic presenters who can offer interactive and/or engaging workshops. Workshop blocks are usually 1.5 or 2 hrs. The conference site is rustic and mostly outdoors. There is limited electrical access; presentations requiring projectors or other electrical presentation tools can be accommodated if requested in advance. Presenters are encouraged to participate in the whole weekend. Camping is the standard accommodation; indoor accommodations are available for a fee. Please send a one to three paragraph workshop description with title and a little bit about yourself to conference(at)twinoaks(dot)org. Worker Cooperatives are an important sister movement to intentional communities. Depending on how you define things they are intentional communities, and whereas traditional IC’s have focused on the residential aspects of community living, worker co-ops have focused on the commercial. But if you use a broader definition of economy, one that incorporates all the productive human activities, they are two sides of the same coin. A couple weekends ago I had the pleasure of attending the Worker Cooperative National Conference, hosted by the US Federation of Worker Cooperatives. The event was held in Chicago and attended by about 450 cooperative enthusiasts. More people would have participated if they had not hit the venue’s capacity and had to turn people away. The Federation has been around 10 years now. I attended their first national conference in NYC in 2004, with maybe 200 participants. Since then they’ve created the Democracy At Work Network, a peer-to-peer advisory group for new cooperative ventures, and they’ve recently created the Democracy At Work Institute, a non-profit organization that can accept grants for research, education, and movement building. Not only was the conference expertly organized, the quality of content was very high. Friday night was a showcase of local initiatives, including an amazing spoken word performance by a collective of young men working on restorative justice and part of forming group called Grassroots Ecology. The evening was catered by a new startup catering and restaurant cooperative in Chicago. I attended an amazing workshop on project management by members of the Isthmus Engineering Cooperative. Equal Exchange, a cooperative and forerunner of the fair trade movement, co-hosted a great workshop on Boards and cooperative governance. Tours were organized to look at cooperative endeavors and movements, both present and historical, in Chicago. There were a number of keynotes, including a presentation on the cooperative movement in the Emilia Romanga region of Italy, which rivals the more well-known Mondragon cooperatives in Spain in size and scope. There were also people at the conference from housing cooperatives and collectives, as well as other kinds of cooperative projects and community organizations. I was at the conference to a large degree as a representative of the Federation of Egalitarian Communities. Many FEC communities incorporate businesses and residences, along with many other resource sharing systems. Part of why I live at Twin Oaks is because I see this as a model for what a full-featured, integrated cooperative economy could look like. Of course, I also realize that not everyone is going to live like we do at Twin Oaks, nor could they. We need a multi-faceted approach in transforming the social and economic aspects of society, as well as the infrastructure, to a basis of cooperation, justice, and sustainability. What I found very gratifying is that while the focus of the event was on worker cooperatives, there was a keen understanding of the need to address all aspects of life and society in developing a cooperative culture. This is what we’ve been trying to do with the Communities Conference as well, focus on this particular branch of the movement, but keep in mind the larger picture of the cooperative movement that we’re all part of. This is what life on the modern homestead looks like. Collecting fire wood for the wood-fired cook stove of an outdoor collective kitchen. Carrying a couple buckets of water over from the neighbor’s cistern. Then heading back to my host’s straw bale house to check my email and write a blog post. I’ve had the pleasure the last couple days of staying at Red Earth Farms, one of three communities of what’s known as the tri-community area of northern Missouri (along with Dancing Rabbit Ecovillage and Sandhill Farm). The area is a hot spot for natural building and other aspects of sustainable living. And part of what I find particularly compelling is their selective application of industrial technology. I don’t think we really have any idea of what sustainable means. Twin Oaks has managed to cut out something like 70% of the junk industrial society produces. At Red Earth they’ve cut out maybe 90%. What’s left? Molded plastic cisterns fed by ABS plastic piping (less toxic than PVC) from a corrugated metal roof, all of which should last 50 years or more. A couple computers with a high speed internet connection thanks to local electrical cooperative. Lights and a small refrigerator powered by their wind turbine and PV solar panels. A ceramic/carbon Berkey water filter. Mark designed these trusses, made of reused pallet wood. None of the boards are longer than 4′. There are no wells at Red Earth and no electric pumps. All the water comes from rain water catchment in cisterns or ponds, and is either gravity fed or hand pumped to where it needs to go. Alyson (staff and board member of Dancing Rabbit, Inc. and Board member for the Fellowship for Intentional Community) and Mark’s house, in the Gooseberry leasehold of Red Earth, was built with almost all locally sourced materials, either natural in origin or reclaimed (the trusses on the house are made exclusively from reused pallet wood). With the reductions in carbon this represents could the internet and the molded plastic actually fit into a sustainable society? Solar panel with a 12 volt battery wheeled carrier. The other box is a boom box. The Milkweed Mercantile, a pub and B&B, is a straw bale building, and was Dancing Rabbit’s first solely commercial endeavor. Dancing Rabbit has been working with some researchers recently to start getting credible data on what this lifestyle represents when it comes to combating climate change. There are various online ecological footprint tests you can do, but these tests are assuming a predominantly mainstream, individualistic lifestyle. We’re only starting to see the metrics being developed and applied to these alternatives. But what we do already know is that this is, as Helen and Scott Nearing told us decades ago, living the good life. Ma’ikwe, Dancing Rabbit, Inc. executive director, articulates this well in her TEDx talk. The land, despite previously being misused by conventional agriculture, is beautiful, and the folks at Red Earth and Dancing Rabbit are using a sophisticated understanding of ecology to rehabilitate it. The pace of life makes the peacefulness and beauty impossible to miss. And there’s a community of people enjoying each other and creating culture and staying connected to the larger society, because we are, like it or not, all connected to larger society. The folks here understand that and far from escaping are an active, engaged, and living demonstration of what a satisfying and sustainable society might look like. A cluster of buildings in the Dandelion leasehold of Red Earth, including the collective outdoor kitchen shared between them and Gooseberry. Are you part of a community or organization that is new, recently formed, redeveloping, or considering redeveloping? This one-day follow-up to the Twin Oaks Communities Conference on Labor Day, Mon. Sept. 1st, will provide a platform for these groups to consult with experienced community builders, connect with resources, and troubleshoot with other groups. The format for the day will be dynamic and highly interactive – no long series of boring lectures here! We’ll provide opportunities for groups to work with experts on their particular issues. We’ll create forums for discussion on particular topics. And we’ll engage groups with each other to share about their successes and challenges. Topics for the day will cover a broad range of issues from legal/financial to cultural and logistical, and will be guided in part by groups who register early and tell us what they’re looking for! Announcing this years theme for the Twin Oaks Communities Conference! Sharing is no secret. It’s well known that sharing can make your life better, whether it’s from an economic, social, or environmental perspective. But sharing is daring. It requires trust. It requires communication. It requires a whole set of skills and attitudes not taught to us in our hyper-individualized, capitalist economy. In the mainstream economy sharing is inconvenient, discouraged, or even illegal. Community is about sharing. It’s about changing to notion of ownership from one of control to one of access. Its about the systems and the culture that make sharing possible and make it a force that can solve the biggest problems facing the world today. For some interesting perspectives on sharing, check out shareable.net, kindista.org, and Resilience Circles. We’re also interested in reaching out into the Maker Movement and Makerspaces, so if you’re tapped in let us know who to contact. There’s also the rising concept of Collaborative Consumption. Intentional Communities have been on the cutting edge of sharing for decades, and continue to push ideas of what’s possible. What do IC’s have to offer this new interest in sharing, and how are they relevant to this possible sharing revolution happening in larger society? These are some of the ideas we’ll explore this year. Hope to see you there! While you’re making plans to come to the Twin Oaks Communities Conference you should also plan on attending two other important events. The Farm in Tennessee is having its conference on Community and Sustainability May 23 – 25. The US Federation of Worker Co-operatives is hosting it’s bi-annual National Conference the next weekend, May 30 – Jun 1, in Chicago. The Communities Conference at the Farm is a unique opportunity to tour Green Homes of all types, see Sustainable Food Production at work, over 89 KW in Solar Installations, learn about Alternative Education, Conflict Resolution, Land Trusts, Midwifery and so much more. have a blast building a liberatory economy!